Finally, contributors are back to the balances they held before the global financial crisis. It has been a long return, but superannuation funds have finally clawed back their post-GFC losses thanks to strong gains in equities. That means someone with $100,000 in a median balanced fund before the crash in 2007 is back to where they were (see graph). But what a painful journey it has been, particularly for older fund members. The latest SuperRatings data shows the median balanced fund - where most people have their retirement savings - delivered 10 per cent over the 12 months to September 31, or 6.3 per cent a year for the past 10 years. The SuperRatings research manager, Kirby Rappell, attributes the double-digit returns to a strong performance on Australian and international sharemarkets. Overall, balanced funds are on target to achieve their long-term objective, earning 6.5 per cent a year for the past 20 years. ''If you look back to 1992, when mandatory super was introduced, super has delivered on its long-term promise of the inflation rate plus 3.5 per cent,'' Rappell says. So should consumers feel better? Mercer's latest index of global pension funds shows Australia's $1.4-trillion super system is ranked third-best in the world, up from fourth place last year. David Knox, a senior partner at Mercer and author of the report, says the score is based on the best weighting for a pension system across all age groups, including pensioners. However, the typical Australian super fund has more than 70 per cent of its money invested in growth assets, which is high by world standards. The best scores went to countries with between 40 per cent and 60 per cent of their pension savings in growth assets. 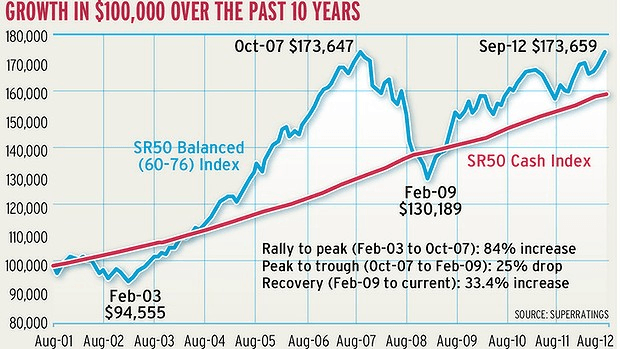 A sharemarket crash prior to retirement can be devastating. Knox says taking a life-cycle approach to super is best for most people. Asset allocations vary with age. As members age, growth assets are reduced and safer assets (bonds and fixed interest) increased. Over the past 20 years, super funds have changed from defined-benefit schemes to defined-contribution schemes, shifting risk from the employer to the employee. Knox says until the early 1990s only a third of people had super. ''The introduction of mandatory super in 1992 changed all that. Everyone gets at least 9 per cent across the whole workforce,'' he says. But that shift means being ''disengaged'' is not an option. In the aftermath of the GFC, members discovered that investment labels meant little. ''Balanced'' funds lost a third of their value because of a heavy exposure to equities; ''capital stable'' options went into the red; and ''cash'' made losses.